The Simplest Cable Management and Projector Control Solution. Centralised Control Box – manage your Epson short-throw or ultra-short-throw projector (power, AV mute, volume, sources; wall mounted, no remote control needed. Optimised for connectivity – supports an array of sources, including 2 HDMI inputs for displaying content from high-definition devices, connect the latest MHL-enabled smartphone or tablet via MHL cable. Consolidated Cable Management – convenient wall placement helps avoid potential hazards. Increased Flexibility – use as an extension box to expand the range of your cables. Easy Operation – large, individual source buttons intuitively match Epson projector inputs. Amplify Instruction – optional speakers boost sound and ensure the entire class can hear the lesson. 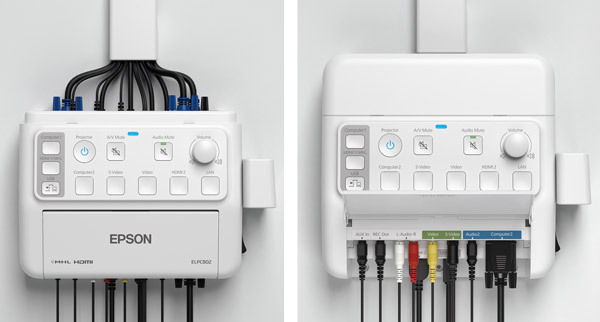 Centralised Control BoxThe Epson ELP-CB02 Connection and Control Box, is a solution that offers extensive control of multimedia sources connected to Epson’s wall-mounted short-throw and ultra-short-throw classroom projectors. The ELP-CB02 gives teachers one convenient place to connect and manage audio and video sources such as computers, Blu-Ray players, iPods, and more. The ELP-CB02 is a wall-mountable control box which features large, easy to use control buttons and a cable cover that creates a clean, organized look to help avoid cable chaos. The control box is designed to mount on the wall next to the projected image, making it easily accessible to educators and enabling them to change sources or adjust volume with the press of a button, eliminating the need for a projector remote control. The various input/output connections available include: two HDMI with one MHL connection, two VGA (computer 1 and 2) connectors with corresponding Audio (inputs/outputs), S-Video with Audio (inputs/outputs), AUX Audio (for use with devices such as an iPod), USB Type A, USB Type B, and Record Out. The ELP-CB02 also allows the selection of audio mute and volume adjustment for the optional Epson ELP-SP02 speakers. The ELP-CB02 also includes a handy attachment that allows users to store their iPod or Epson Interactive Pen on the side of the box. By offering a central point for all source cables to connect, teachers now have the flexibility to integrate a wide range of multimedia devices into their teaching that might previously have been much more expensive to manage with a ceiling-mounted projector.